See What's On in Melbourne and Victoria by month, January, February, March, April, May, June, July, August, September, October, November, December, or follow links to cinemas, theatres, museums and historic attractions, general attractions and festivals around Victoria. Community Groups & Services include listings with links to community and support groups, services and arts groups. Keep up with the latest news & current affairs and political and lobby groups in Victoria. Melbourne, capital city of Victoria, is the second largest city in Australia. Almost 3/4 of the Victorian population live in Melbourne. Melbourne's commercial centre lies on the northern bank of the Yarra River, which enters Port Phillip Bay. 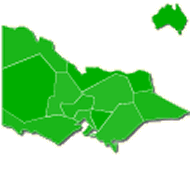 Suburbs spread to the Dandenong Ranges in the east. Ballarat is Victoria's major inland city. See our travel information including a Melbourne CBD Map and Melbourne Hotels & Accommodation. In the Tours, adventure and activities section, you'll find everything from leisurely river cruises and visiting the penguins to skydiving and hot air balloon rides. Travelling the Great Ocean Road is a popular experience – either in your own car, a hire car, or an organised tour. Melbourne Transport links to transport information. Melbourne is famous for its trams – you can even have dinner on the tramcar restaurant. See pages for Victorian towns and regions with information, accommodation and tours.